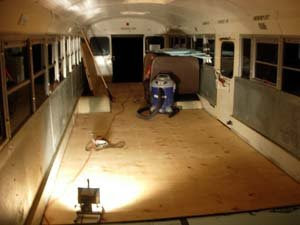 Today we actually drove the bus down to the local lumberyard to get the necessary materials that we would need. This was the first time money was actually spent on this project (not counting the the bus purchase of course). I think the total amount spent today was around $250.00. 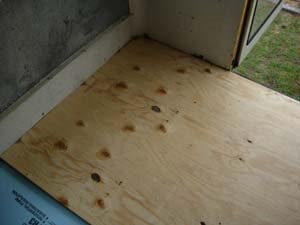 We purchased 8 sheets of 1/2" Plywood, 8 sheets of 1/2" Construction Foam, 105 Phillips Oval Head Stainless Steel Screws sized at: 12 x 1-1/2" (for screwing the plywood down), 1 can of Rust Stop Primer (probably could have used 2), 1 roll of Window Flashing (the sticky black tar stuff) and 2 tubes silicone caulk. I think that was everything. Next we made sure the bus was dry from the previous day of cleaning. Then we re-swept everything and made sure it was good and clean. I decided to go around and use the rust stop on all major spots of rust. 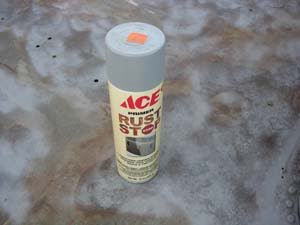 This was just to insure we would not have future problem with rust. 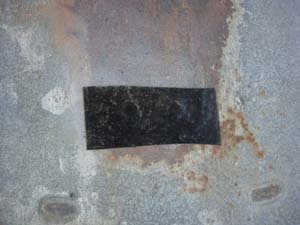 Then we used stick down rubber window flashing (hope that is what it is called) to cover all the bus seat bolt holes. After that I went around with Silicone and sealed every crack and small holes left over. We decided to lay construction foam for a base. 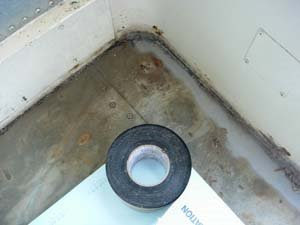 This will provide a vapor barrier as well as insulation and help deaden any unwanted noise. I haven't seen anyone else do it this way so I hope it all works out. The back of the bus is rounded and I needed a way to get a perfect cut. The roll of flashing worked perfect as a guide. Looks pretty good! I will have to use the same pattern for the plywood. 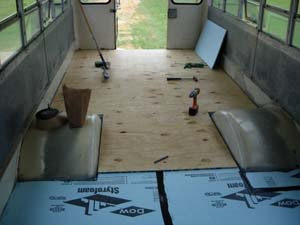 We laid the foam vertical and the plywood horizontal. We would lay a few pieces of foam and then plywood and then more foam. We did it this way and worked our way to the front. We pre-drilled the screw holes first. 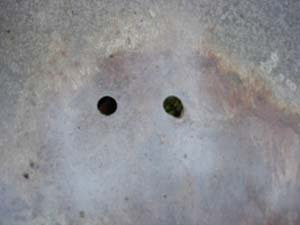 I was not very impressed with the stainless steel sheet metal screws that we purchased. Many of the heads broke off and some of the threads stripped. I ended up having to drive them in very slow then they worked ok. I guess the metal on these buses are really ridged. 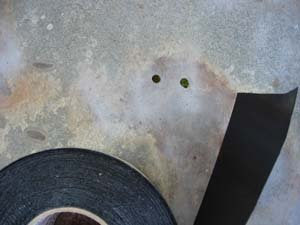 As we went we made sure to sweep and used the shop vac to make sure no debris got under the plywood and foam. 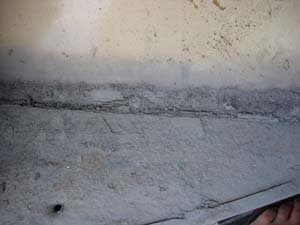 As you can see we used the window flashing to also seal all the cracks in the foam. As we moved forward we moved all the things that were now in our way to the back of the bus. This saved moving it over and over again. By now it was getting dark and we were tired. 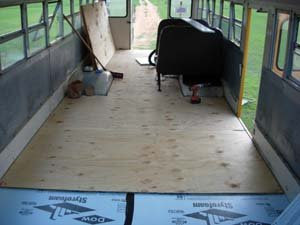 We have just a couple peices of plywood to go and then we are done with that stage. We will probably be back on the bus on friday. See ya all then! So Amazing! Love it...but big project;I would need someone else besides me helping with the work for sure! If it's ok to ask..about how much do you have into this Beautiful Bus....Thinking something like this will be a future goal of mine!! 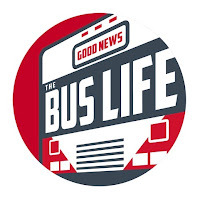 A rough estimate would be around $30,000 for the whole project including the price of the bus. 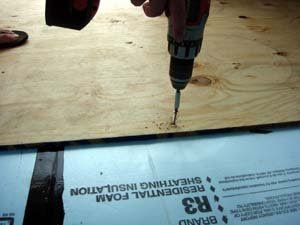 It can be done for less with less expensive materials. Fascinating and inspirational, what a beautiful job you've done too. 1.) 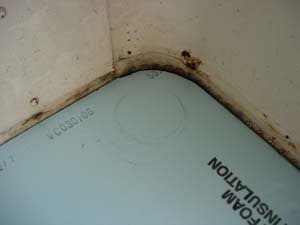 how thick is the flooring that you put down? 2.) do you think a person could use the rear heater hoses to rig some kind of infloor heating loop? 3.) how do you attach the studs to the wall and ceiling? The hardwood is only 1/4". 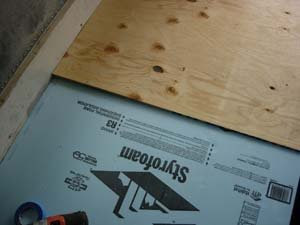 The infloor heat is an interesting idea that may or may not work. If I remember right we always did our best to tie into the bus ribbing from the inside.